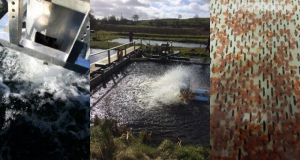 ECOAQUA is an innovative multidisciplinary aquaculture project led by NUI Galway and Athlone Institute of Technology is set to improve production efficiencies and management of farmed fish at several inland freshwater sites. The project has received €348,781 in funding under the European Maritime Fisheries Fund (EMFF), administered by Bord Iascaigh Mhara, through the Knowledge Gateway Scheme, on behalf of the Department of Agriculture, Food and the Marine. Image (L-R): One of the new aeration technologies being trialed. One of the pill ponds at one of the EcoAqua partner sites. Salmon fry at another of the EcoAqua partner sites. For further information about the project contact Mr Alan Kennedy, Project Manager, ECOAQUA at michaelalan.kennedy@nuigalway.ie.